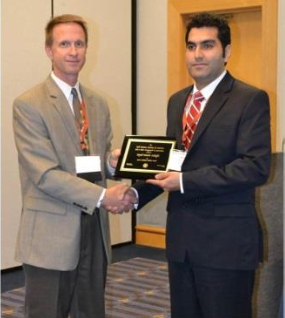 Soil Science Society of America | Congratulations to Mr. Hossein Sadeghi as the recipient of the 2013 Graduate Student Award! Hossein is a Ph.D. candidate at Washington State University under the direction of Dr. Troy Peters in the Biological Systems Engineering Department. Hossein has been described by his advisor as “a brilliant and productive Ph.D. student with big dreams and with high standards of scholarship and high expectations for himself.” Hossein is currently researching “New methods to evaluate and adjust the design and operation of center pivot and micro-irrigation tapered laterals for improved efficiency” at the Irrigated Agriculture Research and Extension Center in Prosser WA. The goal of this research is to save water and make irrigation management easier for growers.